About a month ago, Burger King proposed a truce with its longtime rival McDonald's. Burger King extended an olive branch to McDonald’s, calling for a one-day ‘burger wars’ ceasefire, on 21 September 2015 -- better known as Peace Day. Peace Day is a United Nations-recognized annual day of global unity, successfully advocated by the non-profit organization Peace One Day. It was proposed that on Peace Day, Burger King and McDonald's set aside their differences and unite to create the ‘McWhopper’ - a burger that combines all the tastiest ingredients from their signature sandwiches, the Big Mac® and the WHOPPER®, in one delicious, peace-loving burger. McDonald's said no. Sales apparently matter more than peace to that global restaurant chain. Undeterred, Burger King began collaborating with Denny’s, Wayback Burgers, Krystal, Giraffas USA to produce the Peace Day Burger™. The Peace Day Burger™ combines all the tastiest ingredients from the restaurants’ signature sandwiches into one delicious, peace-loving burger. This culinary mash-up of a lifetime will contain parts of Denny’s Bacon Slamburger, Wayback’s Wayback Classic, Krystal’s Cheese Krystal, Giraffas’ Brutus and Burger King’s Whopper sandwiches. 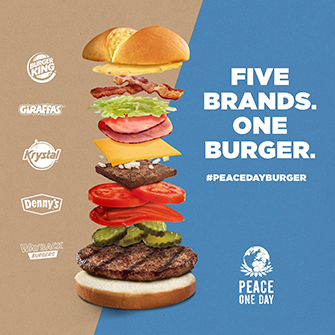 “We are really proud to be part of the Peace One Day corporate coalition and to see that the awareness of Peace Day in the US is almost five times higher among those who saw this campaign than those who were not aware of it,” said Fernando Machado, Senior Vice President for Global Brand Management at Burger King Corporation. “We were overwhelmed by the goodwill of our fellow restaurateurs, and believe that working with them to create this once-in-a-lifetime burger is a beautiful twist of fate."